I have many, many cacti and succulents in my home (and not just the fake ones I make for my Etsy shop). I loooove them ... There's so much variety, they hardly grow so they basically look the same all the time, and I can forget to water them for a month and they somehow still survive. So when I saw this post from A Beautiful Mess, I was inspired. I found the perfect planter for a dining table centerpiece at Salvation Army, then went to Lowe's and bought some cactus soil, a four-pack of succulents, and a couple cacti. I think it's pretty cute and makes a good centerpiece for our square table. This project was quick but a little more than I usually spend on my projects (around $30 for everything). I think it was totally worth it. 1. I wanted to use soaker hoses to water the plants and also didn't want to waste space between beds so the garden is one giant bed rather than eight separate 8'x4' beds. 2. Another reason why I made one continuous bed was for ease of installing deer fencing. If the beds had been separate, I would've had to build the fence around the beds, which means more fence posts, more mulch, and more fencing. The way the garden is now allows for one-100' roll of fencing to go around the entire perimeter with some extra left over for the door. 3. Maximizing lumber was essential. The dimensions of the garden allow for that. Even though I have to step into some of the beds to reach plants, it was worth it to me to keep the project economical. I used 1"x6"x12' boards and ended up needing 17 with little scrap left over. 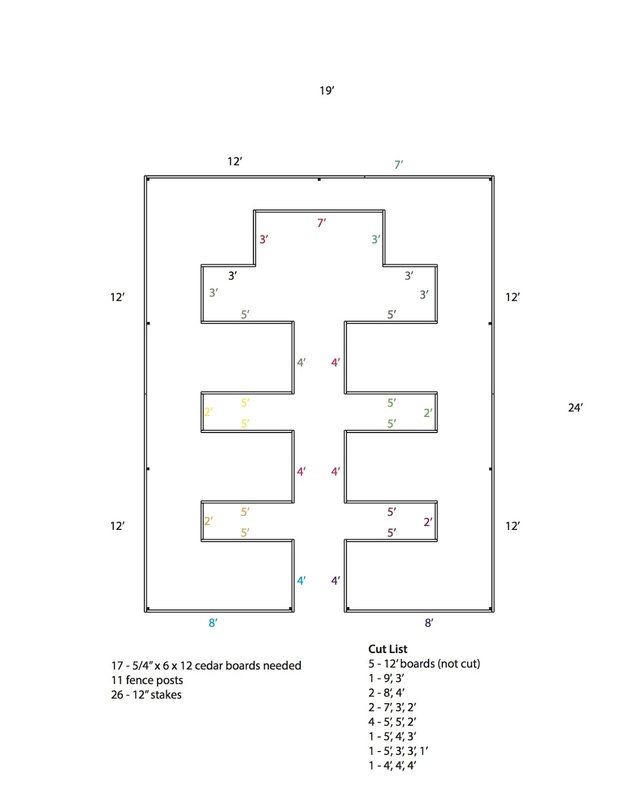 Each color on the plan above is a separate 12' board. 4. I wanted to be able to enjoy my garden. That's where the cut into the bed comes in at the top, straight back from the door. I left enough space for two chairs and a table.